Fragrant. 3 to 4+ Feet. July flowering. Pure white flower face, but with very attractive medium pink buds and petal reverse. These fragrant, heavily substanced and well proportions flowers last a long time in the garden, for over three weeks last summer in our field, which was full sun with 80+ degrees in 2017. We watched this lily for many years before having enough planting stock to release and with the passing of each year, it only got better and better. 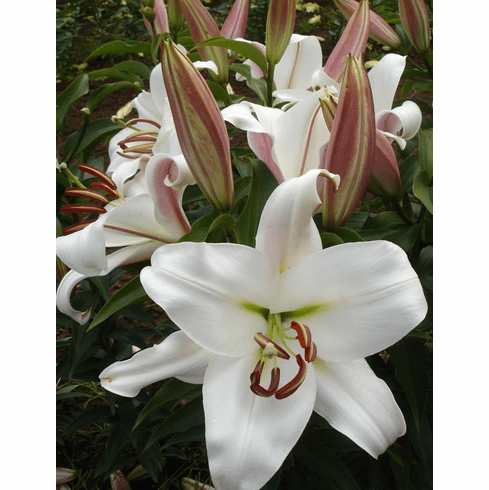 'Pink Snowflake' is destined to be the 'Casablanca' of the Orienpet Lilies. 3 to 4 Feet+. Late July / Early August Flowering. Bulb Size - Our standard for bulbs of this Orienpet Hybrid Lily Bulb cultivar ranges from Premium-size (16/18 cm) to Exhibition-size (over 20 cm).